As with previous novels, in ‘Lucy Willow’, Sally Gardner makes a powerful and heartfelt assertion as to the roles individuality, belief and responsiveness to one another and our environment play in establishing a conducive cultural climate. Eponymous Lucy Willow is a girl who, together with her pet snail Ernest, lives an extraordinary life. Their abode consists of three railways carriages and their lifestyle is idyllic, if not somewhat non-conformist! Privatisation of the stretch of railway on which they live, however, threatens the Willow family’s lifestyle forcing Mr Willow to take a job at the local, fairly dilapidated garden centre, Peppercorns. It is the understated beauty, liveliness and interest in the curious that makes Gardner’s fiction toasty-warm, satisfyingly familiar and yet at once extraordinary. They feel to be fairy-tales etched out of the modern day and are augmented admirably by Peter Bailey’s sparsely expressive illustrations. An achievement indeed. Opening with the cataclysmic change for brothers Joshua and Jamie as newborn step-sister Jennie is brought into the world, ‘Cat Call’ expertly contrasts knowledge and understanding against fears and doubt. Stepping beyond mere sibling rivalry, childhood neurosis is depicted here with an astute accuracy, but also with compassion and perception. Overt didacticism is skilfully avoided as through Joshua’s often laconic narration, Newbery carefully negotiates the feelings of brother Jamie, his jealousy of his sister and the manifestation this takes as he becomes horrified by the force and intensity of these internalised feelings. An impressive depth of knowledge is presented into all things feline ‘ from factual information to mythology. The tectonics of familial relationships and alliances are related with extraordinary power and prowess. The success of ‘Cat Call’ is the genuine credence it affords to insecurity and its lithe ability in so doing to avoid the slightest patronising hue. ‘Three for Tea’ collects three stories by each of the children’s laureate authors, anthologising these for the first time in a single volume. Jacqueline Wilson’s story ‘My Brother Bernadette’ takes an astute look at gender stereotyping as the bully-boy of the summer project, Big Dan, picks on sensitive and creative Bernard prompting the group to follow his lead. Rugged determination wins the day, however, as Bernard single-mindedly sets out to learn to sew and through so doing finds a highly creative way to wreak his revenge upon Big Dan. The clock is on in Anne’s Fine’s ‘Countdown’ which sees Hugo desperate for a pet gerbil. His dad agrees provided Hugo is able to stay alone in his bedroom for seven-hours, the length of time any prospective pet gerbil would be expected to entertain itself within caged walls during Hugo’s absence at school. This compassionate and deft allegory stimulates early moral and ethical consideration. One of the most familiar and favoured dogs in children’s literature makes a return in this annual account of life. Beginning in January, Kipper takes photographs with his new camera ‘ used to photograph key events in each month ‘ and makes a New Year’s resolve not to throw snowballs at Tiger. This is quickly broken, however, as in February the snowfall proves too tempting to pay no heed towards. March, April and May elapse with high winds, ponds full of frogs and tadpoles and blossom and ducklings. The summer months of June, July and August pass in a reverie watching insects in the long grasses, of hot, hot storms and of summer holidays. Autumn arrives and with it the months of September, October and November bring brambles full of blackberries, pumpkins, twiggy branches and warm, misty breath in frozen air. 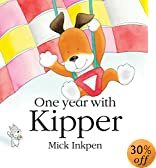 The story concludes in December as Kipper prepares for Christmas, making a special present for his friend Tiger, this it transpires is the yearbook with all of the photographs he has taken throughout the course of the book. Special mention must be made of the different palettes Mick Inkpen sensitively utilises to successfully evoke each of the seasons, the blues and white of winters, the fresh greens of spring, the bright colours of summer and the golden browns of Autumn. Uan is Gaelic for lamb. Set upon a small, somewhat old-fashioned, though beautiful island in the sea, a farming family live, battling against the elements to secure a livelihood. One springtime an abandoned newborn lamb is found of the shoreline. Bedraggled and famished, the lamb is rubbed dry, given milk and placed in a box next to the range. The family adopt the lamb and take special care of her to compensate for the absence of her mother. She is played with and cuddled and as she grows in size and strength, so too she grows in confidence following the children of the family everywhere. Eventually Uan has grown big enough to join the other lambs in the field, where she plays games with them and has fun. She becomes a sheep and one day has a lamb herself, becoming the best mother in the world. This is a tender, sweet story evoking the love and care that enables children ‘ of whatever species! ‘ to grow and develop, finally being able to utilise the knowledge and experiences of their own childhood experiences responsively. Those who have followed Oscar and Arabella, that indomitable, woolly mammoth duo, in their picture book adventures: ‘Oscar and Arabella’ and ‘Hot, Hot, Hot’ will be delighted to learn that the pair have ascended to school age. On arrival of a letter from Professor Snout at the Mammoth Academy, the pair are both advised as to the items they will need in readiness for their first school day. Use of the novel form, allows significant character development, Neal Layton includes a facsimile of Oscar’s letter ‘ and later of his school map ‘ both of which have been rather carelessly crumpled and smudged! It transpires the tracks lead to the kitchens where a thief has been stealing oranges. The mystery unravels and Oscar becomes entwined in playing out the role of detective in a furiously paced adventure that sees him do battle against the humans using a rather unwieldy prehistoric skateboard! This novel will appeal to those who have enjoyed Ian Whybrow and Tony Ross’ ‘Little Wolf’ series. Illustrations and text alike are brilliantly executed by Neal Layton whose brilliant first novel guarantees mammoth amounts of fun! In the summer of 2002, Springfield librarian Molly McGrew drives her mobile library into the zoo. Initially, the animals are suspicious and resistant and it appears folly, but librarian Molly, armed with knowledge of the best story to read to conquer the biggest level of resistance, attracts a mink and a moose by reading aloud from good Dr Seuss. Shortly thereafter a stampede for reading begins with each animal and creature having his or her own particular penchant. The giraffes love tall books, the geckos love stick to the wall books, the pandas love Chinese books, the otters love water proof Harry Potter, the llamas love dramas and the hyenas and snakes love joke books. ‘Wild About Books’ succeeds brilliantly in showing the diverse reading tastes that can accompany a love of books, it emphases the importance of discussion, of dialogue and of debate. Reading is not show here as being solitary and isolated, but real culture for reading is depicted. A marvellous achievement and one itself that reads aloud in a group brilliantly well and is a gift for the level of tie-in craft sessions and activities that could so easily be themed around the story. The eagerness to care, look after and show warmth towards a creature, to find companionship and closeness, together with the fascination for dinosaurs, forms the basis of one of Hiawyn Oram and Satoshi Kitamura’s justly acclaimed collaborations. ‘A boy wants a dinosaur’ is re-issued again this year by Andersen Press. Ben has a dog, Alice has two snails, but poor Alex is desperate for a dinosaur, showing compassion his grandfather states ‘A boy wants a dinosaur this much, a boy should have a dinosaur‘. So it is that the pair take a trip to the gargantuan glass ‘dino-store’ ‘ a veritable haven for those who desire a dinosaur! After much agonising over species selection, Alex chooses a Massospondylus, a dinosaur that eats everything. Alex calls her Fred. Fred requires ample food, ample sleep, ample water for her bath and ample walks’ shortly after gaining perspective into the cumbersome practicalities of having a dinosaur as a pet, Alex awakes, finding he had only dreamt of having a dinosaur, together with grandfather he decides a rabbit would make a far better suited pet! Indulgent text and lavishly good humoured illustrations combine to make this a richly imaginative and fiendishly funny story with a considerate caution about the responsibility a pet entails.